Skywatchers in the eastern United States have an opportunity to spot the launch of the SpaceX Falcon 9 rocket on an International Space Station resupply flight on Sunday night (Oct. 7), weather permitting. The night launch will mark the fourth flight of SpaceX's Falcon 9 rocket, a privately built boosterthat has made three successful flights since 2010. The rocket will be carrying the gumdrop-shaped Dragon capsule to the International Space Station. In May the Dragon capsule became the first U.S. spacecraft to reach the space station since NASA's last space shuttle flight departed in July 2011. To reach the space station, the Falcon 9 rocket must be launched when Earth's rotation carries the launch pad into the plane of the station's orbit. That will happen on Sunday at 8:35 p.m. EDT (0035 Monday GMT) at Launch Complex 40, SpaceX's launch pad at the Cape Canaveral Air Force Station in Florida. The Falcon 9 rocket launches into orbit using two stages. The first stage utilizes nine Merlin 1C engines which will burn for three minutes, then shuts down. Five seconds later the first and second stages will separate. Seven seconds later the second stage, which utilizes just one engine will be fired and will burn for six minutes and two seconds. The Dragon space capsule will then separate from the second stage and head into orbit. So while the first stage should create a fairly conspicuous bright light in the sky, the second stage will likely be considerably dimmer. "The first stage from what I see is very bright source of light. The second stage won't be as good for causing a light show. So once the first stage is done, the nice light show is over. The light coming from the second stage won't be as bright, so not everyone will have a nice view." Veteran satellite watcher, George William Herbert said: "It won't be the same as the shuttle, which is much, MUCH bigger and whose [solid rocket boosters] have hot glowing white aluminum oxide in the exhaust and smoke trail. However, the Falcon 9 engines burn kerosene and liquid oxygen, (which) are pretty bright, and will be brighter than an Atlas launch, which would be the closest comparison." Another veteran satellite watcher, Richard Langley of Florida said: "I saw the 22 May launch from Marco Island (about 170 miles from Cape Canaveral). Only an extended red dot nears the horizon, but neat all the same." Depending on where you are located relative to Cape Canaveral, Falcon 9 might become visible anywhere from just a few seconds up to perhaps three minutes after it leaves Complex 40 at 8:35 p.m. EDT on Sunday. After the first stage is shut down, Falcon 9 will be visible only by virtue of the light emanating from its second stage thanks to a single Merlin 1C engine. It should appear as a small, pulsating, fast-moving star, shining with a yellowish-orange glow. However, those who remember sighting the brilliant glow of the space shuttle as it raced along the Atlantic seaboard on its way to orbit, may be disappointed in their attempt to sight Falcon 9, whose single engine fires with only a fraction of the brilliance of the three main engines of the shuttle. Still, it might be worth the attempt to try and see what might be seen. As the old saying goes: Nothing ventured, nothing gained. A SpaceX Falcon 9 rocket soars into the predawn sky above Florida carrying the unmanned Dragon capsule on the first-ever commercial flight to the International Space Station on May 22, 2012 from Cape Canaveral Air Force Station. Northeast: Concentrate your gaze low toward the south-southeast about 6 to 8 minutes after launch. For most viewers, Falcon 9 will appear to literally skim the horizon, so be sure there are no buildings or trees to obstruct your view. Because it likely will appear rather small and dim, scanning the night sky with binoculars might help. Depending upon your distance from the coastline, Falcon 9 will be relatively low on the horizon (5 to 15 degrees; your fist on an outstretched arm covers about 10 degrees of sky). If you're positioned near the edge of a viewing circle, the shuttle will barely come above the horizon and could be obscured by low clouds or haze. If the weather is clear, keep in mind that Falcon 9 likely will appear to move very fast; much faster than an orbiting satellite due to its near orbital velocity at low altitudes (30 to60 miles). It basically travels across 90 degrees of azimuth in less than a minute. And of course, before you head out to look for the rocket, make sure that it has left the launch pad. Live coverage of the launch will be available online from NASA TV here beginning at 7 p.m. EDT (2300 GMT). The launch will also be webcast live, with commentary from SpaceX corporate headquarters in Hawthorne, CA, at www.spacex.com. The webcast will begin approximately 40 minutes before launch. SpaceX hosts will provide information specific to the flight, an overview of the Falcon 9 rocket and Dragon spacecraft, and commentary on the launch and flight sequences. It will end when the Dragon spacecraft separates from the second stage of the Falcon 9 rocket. Editor's Note: If you snap an amazing photo of SpaceX's launch of its Falcon 9 rocket and Dragon capsule on Sunday and would like to share it for a story or gallery, send images and details (including launch viewing location) to managing editor Tariq Malik at tmalik@space.com. 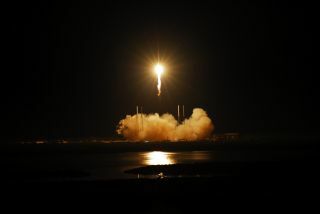 Visit SPACE.com this weekend for complete coverage of SpaceX's first Dragon cargo flight to the International Space Station.